From NPR.org's Health News Blog "Shots"
Children with autism see simple movements twice as fast as other children their age, a new study finds. Researchers at Vanderbilt University and the University of Rochester were looking to test a common theory about autism which holds that overwhelming sensory stimulation inhibits other brain functions. The researchers figured they could check that by studying how kids with autism process moving images. "One can think of autism as a brain impairment, but another way to view autism is as a condition where the balance between different brain processes is impaired," says Duje Tadin, a co-author of the study out this week in the Journal of Neuroscience. "That imbalance could lead to functional impairments, and it often does, but it can also result in enhancements." Tadin and his colleagues presented 46 children — 20 with autism and 26 without — with short video clips of moving black and white vertical bars. The images appeared in three different sizes and all the kids, ranging in age from 8 to 17, had to do was indicate whether the bars were moving right or left. The scientists ran the experiment twice — once with high-contrast images and then again with low-contrast ones. When the black bars were darker and easier to see, the researchers expected the autistic children to do better, figuring they'd be less inhibited by so-called spatial suppression, a mechanism that makes it harder for typical observers to perceive motion as the things they're looking at increase in size. The autistic children did do a lot better with the higher contrast images than the control group, but not because they lacked spatial suppression, it turns out. 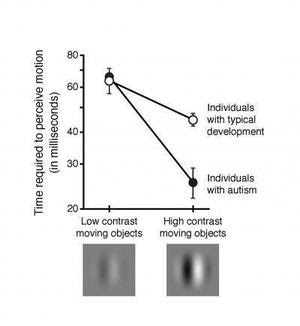 As the image size increased, the autistic kids were slower at recognizing motion. But at each size, they were still twice as fast as the control kids. "That was really surprising," says Jennifer Foss-Feig, another study author. 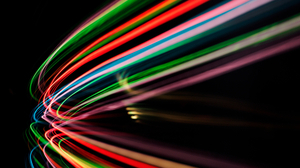 "People have not found this enhanced motion perception before." Even though the researchers' original hypothesis didn't hold up, they think their findings still fit into the broader causation theory. "The thought is that sensory systems develop very early on and if you have differences or deficits in terms of the way your brain is responding to sensory input, that would have real cascading effects developmentally," Foss-Feig says. "So there could be higher order cognitive and social and behavioral deficits."